Check out the videos below to learn about the science of the crater! 2. What Does It Take to Create a 1.2KM Hole in the Ground? 3: How Do Scientists Study Craters? 4: Key Characteristics of Impact Events. Fifty thousand years ago, a giant fireball streaked across the North American sky. It struck the Earth in what is now northern Arizona, exploding with the force of 2 1/2 million tons of TNT. The story of The Barringer Meteorite Crater is a story about the collisions and impacts that have shaped the Earth and other planets in our solar system. But it is also a story about how we know what we know about craters, meteorites, and the planet we live on. The Crater is named for Daniel Moreau Barringer, a Philadelphia mining engineer who became convinced that the crater was the result of a large meteorite striking the earth, contradicting the most eminent scientists of his time. A self-taught geologist, Barringer spent several years studying the crater and providing the initial proof of its origin. Though he never found the fortune in meteoritic iron he was convinced lay beneath the floor of the crater, Barringer’s theory of the crater’s origin was eventually vindicated and accepted by the scientific community. The story of the crater is the story of scientific discovery, and of the heated debates and complex personal histories that make discovery possible. It is a story about how we have come to understand our world, and it begins 50,000 years ago, high above the Arizona desert. The meteorite weighed 300,000 tons and traveled at a speed of 26,000 miles per hour (12 kilometers per second). When it struck the earth in what is now northern Arizona, it exploded with the force of 2 ½ million tons of TNT, or about 150 times the force of the atomic bomb that destroyed Hiroshima. Most of the meteorite was melted by the force of the impact, and spread across the landscape in a very fine, nearly atomized mist of molten metal. Millions of tons of limestone and sandstone were blasted out of the crater, covering the ground for a mile in every direction with a blanket of shattered, pulverized and partially melted rock mixed with fragments of meteoritic iron. When the dust settled, what remained was a crater three-quarters of a mile (about 1 kilometer) wide and 750 feet deep. The impact occurred during the last ice age, a time when the Arizona landscape was cooler and wetter than it is today. The plain around it was covered with a forest, where mammoths, mastodons and giant ground sloths grazed. The force of the impact would have leveled the forest for miles around, hurling the mammoths across the plain and killing or severely injuring any animals unfortunate enough to be nearby. Over time, the landscape recovered. A lake formed in the bottom of the crater, and sediments accumulated until the bowl was only 550 feet deep. Then, with the ending of the ice age, the climate changed and dried. The desert that we see today has helped to preserve the crater, by limiting the erosion that might otherwise have blurred or erased the traces of the ancient impact. Although meteorite falls had been observed for hundreds of years, until the twentieth century no one had ever identified a crater created by a meteorite. Most scientists rejected the possibility of such a crater, believing that all natural landforms had been created slowly, over thousands or even millions of years, rather than in a single catastrophic moment. Gilbert’s prestige was so great that none of his colleagues or successors was willing to publicly question his conclusions, even when it became apparent that some of those conclusions had been wrong. In keeping with his careful, methodical approach to science, Gilbert visited the crater to test two hypotheses about its formation. The first was that it had been formed by the impact of a giant meteorite. The second was that it was the result of an explosion of superheated steam, caused by volcanic activity far below the surface. By comparing the volume of the hollow of the crater to the volume of the ejected material. By experimenting with magnets to test for a large mass of buried iron. If the meteorite were still under the crater floor, he reasoned, the space inside the crater would be smaller than the volume of material thrown out by the impact. And a large mass of iron would attract a magnet, altering the direction of a compass needle. The results of both tests were negative. Gilbert concluded that the crater was created by a steam explosion, and that the thousands of meteorite fragments lying around it were simply a coincidence. He later used his investigation of the crater, and his own abandonment of the impact hypothesis, in a series of lectures illustrating the application of the dispassionate scientific approach. After graduating from Princeton University in 1879 at the age of 19, he went on to become president of his class at the University of Pennsylvania Law School, from which he graduated in 1882, receiving his A.M. from Princeton in the same year. But the practice of law bored him. His real interests were in the outdoor life and in big game hunting in the West, where Theodore Roosevelt and the author Owen Wister were his hunting companions. In search of an occupation that would allow him to pursue these interests, he turned to mining, and by 1902 had made himself a considerable fortune. In a casual conversation with Samuel J. Holsinger in 1902, Barringer became aware of the existence of the crater and the meteoritic iron around it. They were sitting on the porch of a Tucson hotel, having gotten bored with the musical performance inside. As Holsinger later recalled the incident, Barringer “dropped his cigar”, and exclaimed, “That must be impossible! If true why have I not heard of this remarkable phenomenon before?” Like Gilbert, Barringer reasoned that if the crater had been formed by such an impact, an enormous mass of meteoritic iron would still lie buried within it. Without ever having seen the crater, he enlisted his friend, Philadelphia mathematician and physicist Benjamin Chew Tilghman, in the formation of the Standard Iron Company, and began securing mining patents for the crater and the land around it. Barringer’s conclusion about the impact origin of the crater was still only a hypothesis. In order to raise money for his planned mining venture he had to convince the scientific community that he was correct. Barringer and Tilghman set about gathering evidence in support of Barringer's claim. Before long, the search for a nickel-iron fortune had become deeply entangled with Barringer’s quest for the prestige of being the first person to prove the impact origin of the crater. The large quantities of meteoritic iron, in the form of globular “shale balls”, scattered around the rim and surrounding plain. The random mixture of meteoritic material and ejected rocks. The fact that the rock strata in the rim and on the surrounding plain appeared to have been deposited in the opposite order from their order in the underlying rock beds, indicating that the topmost material had been thrown out of the crater first, followed by the rocks from the lower strata. Geologists at the USGS were offended. Some of Gilbert’s colleagues argued vigorously against the impact hypothesis, and even ridiculed Barringer’s conclusions. And Gilbert’s great prestige kept others silent, even though they privately admitted that Barringer was right. In 1908, Barringer’s conclusions were championed by the eminent geologist George P. Merrill. Merrill analyzed two new varieties of sandstone discovered by Barringer at the crater, and concluded that both must have been produced by a brief but enormous pressure, greater than any known to occur through terrestrial processes. Merrill also pointed to the undisturbed rock beds below the crater, which proved that the force that created the crater could not have come from below. At around the same time Barringer made another discovery. All previous explorations of the crater had been based on the assumption that the meteorite struck from directly above. Barringer, however, began to test that assumption by firing rifles into mud at various angles, and discovered that a projectile traveling at an oblique angle at high velocity would nevertheless create a round hole. Because of the upward bulge of the south rim, and the symmetrical distribution of meteorite fragments around a north-south axis, he concluded that the meteorite was actually located under that rim, and all further drilling was carried out there. By this time, Barringer was estimating the size of the meteorite at above a million tons. In 1928, $200,000 was raised for a final assault on the meteorite. By this time Barringer’s estimate of its size had risen to ten million tons, and he was envisioning a profit of $250,000,000 on a $500,000 investment. But the directors of the Standard Iron Company were growing nervous. When the new mine shaft hit water in such great quantities that it could not be pumped out, they consulted the astronomer F. R. Moulton for his opinion on the size of the meteorite. Moulton’s answer was devastating. Based on the amount of energy produced by an impact at the enormous speed of a meteorite arriving from space, he concluded that an object big enough to create the crater would probably weigh only 300,000 tons. That was only 3% of the amount claimed by Barringer, and too small to justify any further drilling. In addition, Moulton argued that the energy of the impact would have resulted in the total vaporization of the meteorite itself. Work was halted at the crater. In a flurry of correspondence over the next three months, Moulton’s conclusions were debated by Barringer, his directors, and a number of prominent scientists. Gradually it became clear that Moulton’s arguments were persuasive. On November 23, 1929, Moulton’s second and more thorough analysis arrived; it buttressed the author’s original conclusions with 127 pages of reasoning and mathematical analysis. By November 30, Barringer was dead of a massive heart attack. He had lost nearly all of his own fortune, along with hundreds of thousands entrusted to him by his investors. But his children saw his ideas vindicated. The general public knows his discovery as “Meteor Crater”; its proper scientific name, as determined by the Meteoritical Society, is The Barringer Meteorite Crater. During the 40’s and 50’s, investigations by Robert S. Dietz and others revealed the existence of structures called “shattercones” at many suspected impact sites, although not at the Barringer Crater. These structures, which can be anywhere from less than an inch to more than six feet tall, can only be created by a sudden intense pressure on existing rock. Dietz was able to demonstrate that the apexes of the cones at most of these sites pointed upwards, indicating that the force which created them had come from above. This evidence provided strong support for the idea that the sites were created by meteorite impacts. The presence of shattercones is now considered as one of the criteria for identifying an impact structure. Another feature found only at impact sites is the presence of tiny parallel lines called “planar deformation features” in quartz grains affected by the impact. The intense heat and pressure of the impact causes the crystals to melt along submicroscopic planes, leaving parallel bands of melted and unmelted quartz. No purely terrestrial process can produce enough pressure to create these deformations. In 1960, Eugene Shoemaker, Edward Chao and David Milton were responsible for the discovery of a new mineral at the Barringer crater. This mineral, a form of silica called “coesite”, had first been created in a laboratory in 1953 by chemist Loring Coes. Its formation requires extremely high pressures and temperatures, greater than any occurring naturally on earth. Coesite and a similar material called “stishovite” have since been identified at numerous other suspected impact sites, and are now accepted as indicators of impact origin. Finally, in 1963, Eugene Shoemaker published his landmark paper analyzing the similarities between the Barringer crater and craters created by nuclear test explosions in Nevada. Carefully mapping the sequence of layers of the underlying rock, and the layers of the ejecta blanket, where those rocks were deposited in reverse order, he demonstrated that the nuclear craters and the Barringer crater were structurally similar in nearly all respects. His paper provided the clinching arguments in favor of an impact, finally convincing the last doubters and validating Barringer’s original claim. 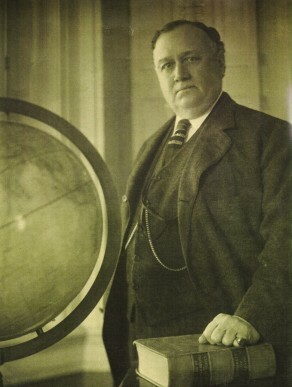 In the ensuing years, Shoemaker became both a friend and a valued scientific advisor to the Barringer Crater Company. Daniel Moreau Barringer’s struggle to prove the impact origin of his crater is an example of the enormous difference that one determined individual can make - even if that individual is a non-scientist working to change the prevailing scientific view. His story tells us about the importance of intuitive leaps, careful data-gathering, stubbornness, and even self-interest in the progress of science. But it also demonstrates the rigorous testing that a scientific hypothesis must endure before it is finally accepted by the scientific community. The progress of science is seldom a simple matter. Gilbert saw the correct answer to the riddle of the crater, but lacked the passion to pursue it further when his first tests failed. Barringer was right when his intuition coincided with his self-interest, but wrong when the truth diverged from it. Both of them ultimately failed to understand the complexities surrounding the crater’s formation because they did not take into account the enormous speed of a meteorite impact, and the enormous release of energy resulting from that speed. A variety of discoveries by different scientists over a period of sixty years would be necessary before the impact theory emerged as the unchallenged winner.